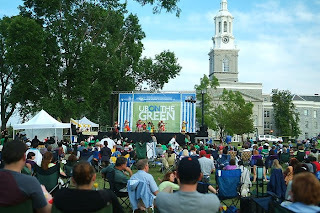 Tonight UB will launch its third season of UB on the Green, a free outdoor performance series held on the South (Main Street) Campus, with a performance by the Buffalo Philharmonic Orchestra. UB on the Green's free music and dance performances will be held from 6-8 p.m. on July 21, July 28 and Aug 4 on the Hayes Hall front lawn. In addition to all-ages entertainment, the series is designed to educate, as well as entertain, with interactive demonstrations and other hands-on activities that are fun for the whole family. Participants are encouraged to bring a picnic, lawn chairs and blankets. Light refreshments will be available for sale. UB on the Green is an alcohol-free, family-friendly event. "UB on the Green is an opportunity to bring the community and university together for more than just good entertainment," said Vincent D. Clark, director of UB Community Relations. "This event provides opportunities for residents to organize and keep our neighborhoods strong by joining a block club or neighborhood watch, attending a safety training or participating in other neighborhood associations." Designed to showcase the university's resources, as well, the series also will include participation by the UB pediatric dental clinics, the Department of Mechanical and Aerospace Engineering and the UB Anderson Gallery, as well as other local community organizations. The series will begin on July 21 with a program of light classics by the Buffalo Philharmonic Orchestra. Conducted by Paul Ferington, it is the orchestra's first return to the South Campus for an outdoor concert since 1997, when Ferington conducted a post-Fourth of July show. Local musician Neville Francis and his band, The Riddim Posse will headline the July 28 program, which also will include The Budos Band, a Brooklyn group with a jazz, afro-beat and soul sound. The series will end on Aug. 4 with Taylor Made Jazz, a local award-winning group, and Giordano Jazz Dance Chicago, known for its appeal to diverse audiences. For more information about UB on the Green, contact the UB Office of Community Relations at 716-829-3099.